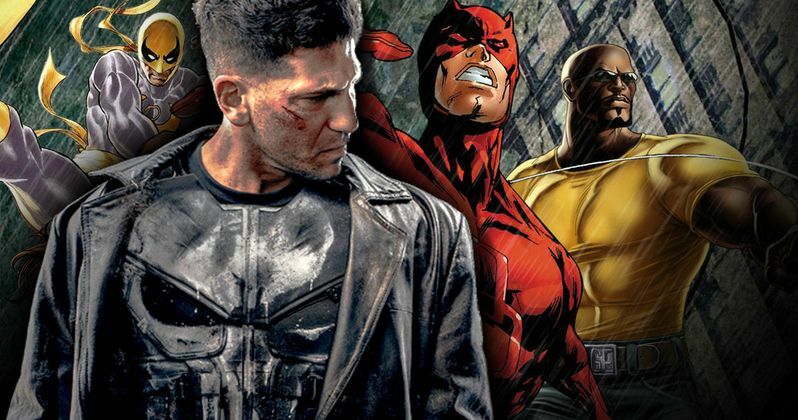 Marvel and Netflix confirmed earlier this year that they are developing a Punisher spin-off series, with Jon Bernthal set to reprise his role as Frank Castle, after making his MCU debut in Daredevil Season 2. Now it seems that we may see The Punisher on the streaming service again, perhaps in Iron Fist, thanks to a recent tweet from New York Comic Con. The convention revealed that the actor's "Netflix production schedule" has altered his involvement in the con, and he will only be available for autograph signings at NYCC on Saturday and Sunday. While the brief Twitter statement from New York Comic Con doesn't say that Jon Bernthal is specifically shooting Iron Fist, it's the only one of Marvel's Netflix shows that is in production. It's possible that the actor could be shooting scenes for The Defenders, but that hasn't started production yet, so the obvious conclusion to be drawn from this tweet is that he's filming scenes for Iron Fist. There is one other possible scenario for Jon Bernthal, though. Jon Bernthal may have even started filming The Punisher series in secret, although that does seem unlikely, since no additional cast members have come aboard. Then again, it's worth noting that many viewers recently spotted a listing for The Punisher on Netflix which revealed the series premiere would arrive in 2017. Still, if the streaming service was eyeing a 2017 premiere, then filming would likely have to begin at some point later this year, which has many wondering if a 2018 debut may be more likely. Regardless, this spin-off is happening, and the last we heard about this Netflix series is that they are eyeing the MCU debut of a Marvel character named David "Microchip" Lieberman. The character is reportedly being cast under the fake name of "Dennis Landstrom," with excerpts from the audition scene revealing that David has tracked Frank down, despite Frank's best efforts to remain hidden. In the comics, Microchip is portrayed as a hard-drinking computer hacker who often provides Frank with technical support during his missions, and even supplies him with some high-tech gadgets. As for Iron Fist, filming started in New York City back in April, but we don't know when production is expected to wrap, or when the show may premiere on Netflix. The streaming service's third Marvel series, Luke Cage, will debut Friday, September 30, with Iron Fist arriving at some point in 2017, along with The Defenders mini-series, but The Punisher's debut date is still up in the air. Another recent report claimed that The Defenders will debut before new seasons of both Daredevil and Jessica Jones. Take a look at New York Comic Con's tweet below, regarding Jon Bernthal's availability.